Providing you the best range of electric steam boiler with effective & timely delivery. 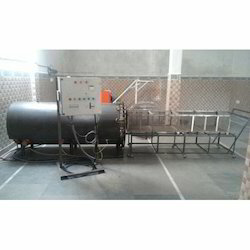 We are well known enterprise involved in manufacturing and supplying highly demanded Electric Steam Boiler. Developed with 304 grade stainless steel, these steam boilers are widely installed at chowmein plants to prepare raw noodles with steam. Our offered boilers are powered by 18 KW voltage specifications and can be availed from us at industry leading price.